You MUST tell me the piston and rod size you need. Answer one of the numerous emails that I will. I have thousands of people using these tough rebuilds for mowing and hundreds of people for tractor pulling all over the world with 100% Posative FEEDBACKS, and we use what we sell! As stated, this is for the K321 Kohler and the suffix on your your model number does not matter. That means that this will work on the K321S, K321AS, K321Q, K321 AQS or any other K321 engine. INSTRUCTIONS on how to rebuild your KOHLER ENGINE. And the oil hole goes towards the cam. I will also give the instructions on how to properly install your connecting rod. The most common reason for premature engine failure on your rebuilt engine is an improper rod installation. New Piston: Which is PISTON COMES IN : Standard. 030 over, Chrome Piston Rings. CONNECTING ROD COMES IN: Standard, or. EXHAUST VALVE COMES1.125 or 1.375, (Use 1.375 valve on spec, suffix D Model) also have the smaller valve upon request if needed but very uncommon. Please note that my suppliers change the pricing and some of these items I sell at cost. I do not go into all 700 auctions and change the pricing everyday on these quotes every time there is a price change. I sell for the lowest price I can at almost no profit. 3.500 These meaurments are not for the machine shop. The machine shop must have the piston before they can bore the cylinder. Anybody can Rebuild a Kohler engine themselves. PLEASE FEEL FREE TO VIEW OUR FEEDBACKS. 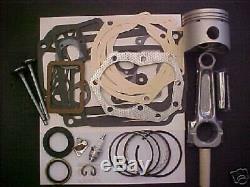 The item "Master ENGINE REBUILD KIT FOR M14 or any K321 14hp KOHLER withvalves" is in sale since Wednesday, March 6, 2013.